My Emilia arrived today. It is much bigger than I expected. I sincerely doubt I would want something larger than this without a dedicated stand. Anyway, one must attach the tie-up bars to the beams with tex-solv. Cutting “14-inch” lengths of tex-solv, burning the ends in an open flame (which it does not tell you that you need, I guess this is not a dorm-room friendly assembly!) for each hole in the back and front beams. One wraps the beam with the cord, one pulls an end through the first hole in the other end of the tex-solv cord, one feeds that resulting tail through the hole in the beam. Then one pinches the middle of the loose half of the cord and shoves that loop into a hole at the end of the cord. One quickly inserts the tie-up bar into that loop and snugs the loop up tight. The cord-loop does not go through the hole in the tie-up bar and just sort of hangs out. Repeat for all beam holes. However, tex-solv cord does not like to have things stuffed through or into its virgin holes. Since the beams and tie-up bars are standard, I am really unclear on why I had to do this. It did not save them any room in the carton. 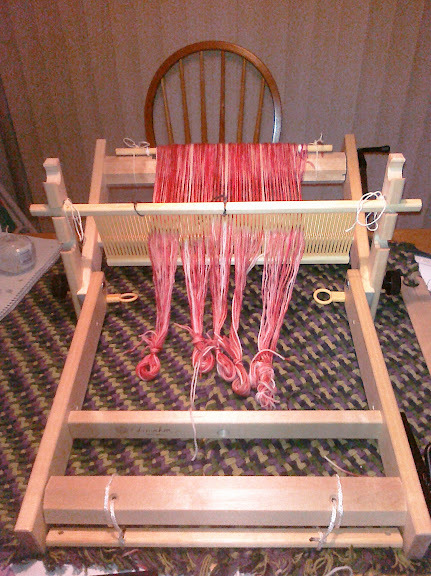 Warping the loom was not fun. I have already failed at it once. The first step is to mark the center of the heddle. Why is this a manual step? It could easily be done at the factory. 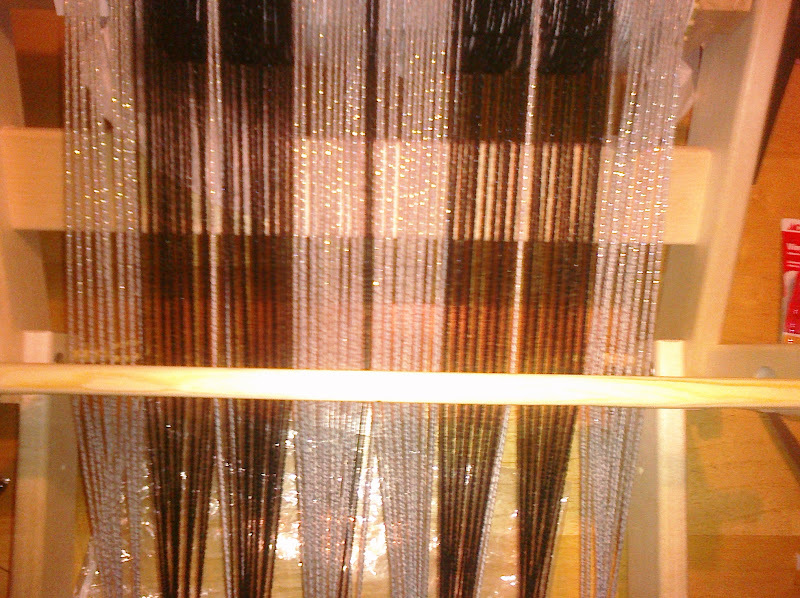 Then one is supposed to center the size of the warp across the heddle and mark those points with threads. Fine. I do this. I follow the instructions about tying the warp yarn onto the tie-up bar, I follow the instructions about fishing the yarn through with the sleying hook. I pull the warp loop around the warping peg. I “keep doing this”. Then I read, “… making sure to wrap the yarn around the tie-up bar after each slot.” That is like a recipe that goes through 45 minutes of prep, 30 minutes of waiting, and after final assembly when the cake cannot wait or it won’t rise, saying, “Bake in an oven preheated to 350F.” Without having mentioned heating the oven up earlier when there was time. So I had to laboriously unwind the warp I had painstakingly fished through a dozen slots. Later I changed warp yarns and began again. I did it correctly. I followed the steps to the halfway point and I am now ready to fish from slot to hole. This has been incredibly irritating and I am convinced there must be a better way than this, because this is ridiculous. I cannot quite imagine a better way, but there are books which should arrive at some point and they might help. There are probably YouTube videos as well. if you say something untrue, that is a lie. I have a complaint about how words were used. If you can mentally hear the guy in The Princess Bride saying, “You keep using that word. I do not think it means what you think it means.” That might help. If you have a website and you say something is “in stock”, especially if you give a count of the number of that item which are “in stock”, I do not think that should mean, “We will call the manufacturer and have it drop shipped to you at some point in the nebulous future.” If something is being drop-shipped at a date uncontrollable by your store, then it is not “in stock”. If you have to call the manufacturer to check whether the item that was ordered and expected to arrive this week is actually available at all, then you completely misunderstood what “in stock” means to the customer. You are also in violation of my expectations of privacy because you are disclosing my personal data to a fourth party (store, shipper, now manufacturer). Although I am resigned at this point to getting the loom I settled for, I am extremely angry at the purchasing experience. If I had known they were going to lie about the availability, I would not have bought the 13″ Emilia, despite the deal. Comments Off on if you say something untrue, that is a lie.